just to specify that it was their actions and not them i wanted to cross ... and i circled 'abuse' to further make sure. I got worried because the oil name is "cross" and i love this person and wish them no harm, but only to cross their own negative actions toward me and learn from there mistakes, as well as not hurt me! i don't believe hexing is a good idea, and was worried it might have been, so i broke the candle, threw it out and burned the paper. i then wrote the name three times, anointed the paper with Jinx Killer Oil and burned it underneath Protection incense. I am worried that the Jinx Killer oil may also have crossing qualities, and may cross instead of throw back a 'cross' or in my situation negativity. Will Jinx Killer oil hurt the target? Does this occur? Or will it cause them bad luck? If Jinx Killer is not a repelling oil only and also does harm them, please help me to understand. i only wish to actually disarm someone's ability to harm and not cause it myself. Please ppl this is the most important individual to me, and i only want to stop abuse or heal the relationship and not cause harm! please help!!!!!!! 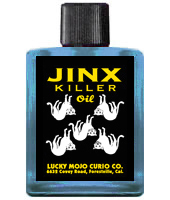 Jinx Killer Oil kills jinxes -- that is, harmful magic. It renders such work "dead." It is not aimed at people when we make it, and if you did not aim it at the person, but only at the negativity, then it would not be intended to harm that person. Yes i did aim the Jinx Killer effect at the person and myself specifically, but i am more concerned about the Double Cross oil. You can use a little in your bath water (the bath crystals are fantastic for this type of work). And, yes, there are specific Psalms that you can recite. I wear glasses and can't see that well.I am actually just looking the psalms for jinx removal and removal of crossed conditions and curses and purification.Which psalm do i recite? Psalms 51 has been prayed before to removed crossed conditions. I finally got my LM products (big order) and one of the items I ordered is the House Blessing Vigil candle. I feel compelled to add a drop (or two) of jinx killer on top of the candle but I would like an expert opinion on this. Thanx in advance! Just make sure that you include that in your prayers. 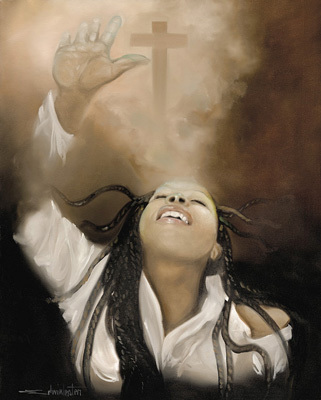 hie, i wonder if i can dress a candle with jinx killer oil and burn it, to remove a old hex put on me 15 years ago, i had a reading and the practitioner said that the curse was weak, and just prayers will help! You sure can do that. You can also have MISC burn an Uncrossing Vigil for you to back up your work. I hope it's alright to ask: how does Jinx Killer differ from Uncrossing? I know both are equally powerful, so I'm not trying to figure out which one is "better." I have just wondered about this for a long time. 1) Jinx Killer is generally used to neutralize jinxes, especially physically laid ones. For Instance, you can sprinkle Jinx Killer Powder on top of powder that someone laid to jinx you. You cannot do that with Uncrossing Powder. 2) Uncrossing is generally used to take off crossed conditions on a person. The two overlap, but each does something the other does not always do. Thank you, miss cat! Perfect clarification. I have been told that I have a love curse on me. Will the Jinx oil remove it? I started burning jinx killer candle for the last 2 days and I have been experiencing fatigue , nausea and feel like my head is floaty, is this normal? Have you considered going to the doctor? That might be a good first step. If they say there is nothing wrong with you physically, it's possible the oil could be affecting you. But go to the doctor first. I will make an appointment but today I feel fine and I haven't burned my candle yet.